Click here to read 28 inspiring leadership quotes published on Inc.com. WorldWide Web Solutions Resume Website Platform – This company offers SEO-optimized resume websites for your clients to showcase their careers and provide a positive online presence with a personal website with their name[dot]com as the address. Social media tools enable your clients to integrate their resume website with LI, Twitter, FB, and Google circles. Market these websites to the right clients and you'll build a steady new revenue stream. Resume Writing Academy – Join the ranks of Academy Certified Resume Writers (ACRWs), graduates of the most comprehensive training in the industry! ACRWs build expert skills in strategy, writing, and design and are eligible for freelance writing projects and more. Do you have a product or service that you'd like to promote to the careers industry? Contact me about sponsoring the E-Bridge newsletter: wendy@wendyenelow.com. CTL Associates enjoy a portfolio of benefits: invitations for various writing, coaching, and publishing opportunities; quarterly brainstorming calls with CTL Advisory Board; savings on CTL events; publishing opportunities in the CTL Article Library; and more. Become a CTL Associate. 5 Free Infographic Templates: Infographics are a powerful tool for capturing the attention of your target audiences. In fact, businesses that publish infographics grow their traffic an average of 12% more than those that don't. Use these templates to find the inspiration and foundation to build your own infographics. LinkedIn Profile Optimization: Follow this 10-step guide for writing LinkedIn profiles that will get your clients FOUND by recruiters and hiring managers, and isn't that what it's all about? This infographic reports that 9 out of 10 recruiters will check out a candidate's LI profile before ever contacting that person! 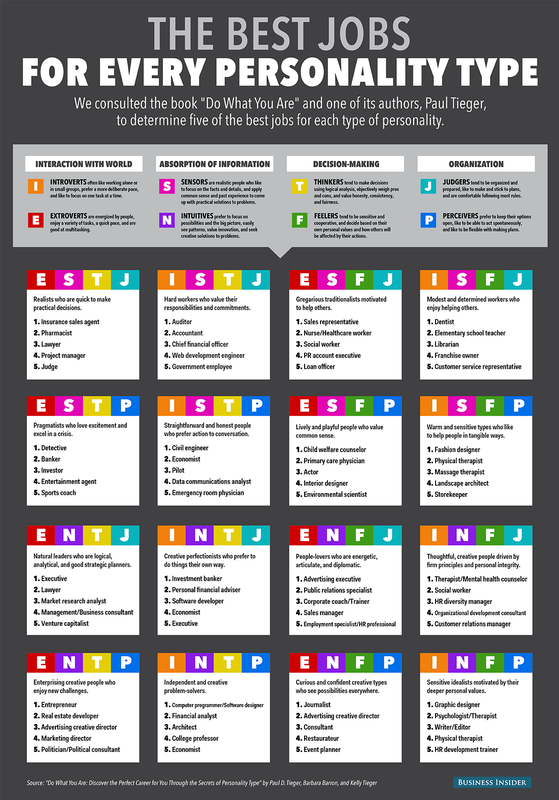 Matching MBTI Types to Career Choices: This infographic identifies the top 5 career choices for all 16 MBTI types. Very interesting reading! How to Stay Calm with Job Interviews: Discover the main reasons that interviewees are nervous and how to combat interview anxiety. It takes practice, but with focus and experience, interviewing becomes easier. Believe it or not, it's actually possible to enjoy an interview! The Infographic Resume: How to Create a Visual Portfolio that Showcases Your Skills and Lands the Job. Written by Hannah Moore, the Career Sherpa, this book is a great resource for every resume writer. Learn about infographic content, format, and the supporting technology. Tell Stories, Get Hired. Daisy Wright, a long-time CTL colleague, has written a great new book that showcases the art of storytelling and its importance in the always-competitive job search arena. Ebook Templates. If you're interested in writing a book but are intimidated by the technology of e-books, visit this HubSpot site for 13 templates. Valuable resource! 14 Job Search Predictions for 2015 (Career Sherpa) Read 14 predictions from 14 different career professionals who discuss everything from resumes to coaching to social media. A good outlook for what's to come this year. 25 Hottest Skills of 2014 on LinkedIn (LinkedIn Blog) Technology … technology … technology. Look at the list of skills and the vast majority are tech related, along with a few in marketing. Then, look at the 10 other lists for countries around the world to compare what's happening in the US to other nations. A lot of what you'd expect and some info that's quite surprising! Top 10 Hiring Trends of 2014 (Paul Petrone, LinkedIn Pulse) Read the author's recap of the top 10 trends in 2014, along with his "bold predictions" for 2015. Most is very positive – great for us and our clients! 6 Easy Places to Find Data for Infographics, Charts & Other Visual Content (Buffer Social) Shareability and engagement power are critical in today's world of information sharing. In 2013, Socialbakers (social media analytics company) reported that 93% of the most engaging posts on Facebook were images, up from 85% in 2012. Only 3% of the most engaging posts in 2013 were regular status updates. This article gives you great ideas on where to find data, use it, visually present it, and tell a story. 25 Best Keywords for Job Search (Career Cast) Written by our friend and expert in all things related to job search technology, Susan Joyce, this article lists the most powerful keywords for a successful search campaign. By the Numbers: 120 Amazing LinkedIn Stats (Expanded Ramblings) In this article, you'll find LI user stats and demographics, job stats, mobile stats, advertising and revenue stats, group stats, SlideShare stats, and more. Very interesting! 7 Interesting Facts About LinkedIn Groups (Things Career Related) LI Groups give you and your clients an arena to express your views, ask questions, share articles, connect, communicate with people who are outside your first-degree connections, and more. In this article, you'll find an outline of the major functions of groups – some of which are very useful for job search, others not very, and others a waste of time. 9 Networking Secrets for Nerds (Inc.) If, as a career coach, resume writer, entrepreneur, or the like, you think that networking is difficult, just imagine if you were a mathematician, scientist, or engineer. The challenges of networking can be enormous for these individuals. Read the article for some great tips; buy the book that's recommended if these are your typical clients. How to Compete for an Out-of-Town Job (Time Magazine Online) Three out of 4 hiring managers recently surveyed by Challenger, Gray & Christmas reported a shortage of local talent. However, many companies are hesitant to hire out-of-towners because of concerns over relocation, money, and more. Learn how to help your clients preemptively address these issues in 3 steps. Whether Working or Job-Seeking, the Algorithm is Watching (NY Times Bits) This very interesting article explores how our online behavior is visible. A recruiter can see how often you're updating your LI profile, while your employer can watch how much time you're spending on social media during the work day. Even more "troubling," prospective employers can survey applicants' online behavior and learn a great deal about them. Each person's digital footprint is there for the following. 22 Time Management Lessons You Need to Learn Now (Life Hack) #1: Labor over the important parts of the project. #2: Say no. #3: Stay true to your vision. #4: Ask people to hold you accountable. Read on...! 7 Ways to Increase Cash Flow in Your Business (Millennial Branding) Improving your cash flow requires a combination of revenue growth along with cost reduction. Read these practical pointers to help accelerate your cash flow and improve your profitability. 27 Hard Questions You Need to Ask Yourself to Be Successful (Business Insider) What are the top 5 things you know you need to do right now that you have been avoiding? Who is the one person in your life you need to build a better relationship with right now? How much money do you need to set aside for your safety net so that you can live the life of your dreams? Read the other 24 thought-provoking questions. What Dogs Teach Us About Meaningful Work (Meaningful Careers) While many humans complain of "working like a dog," bemoaning long hours doing something they don't like to do, our 4-legged friends don't express a whimper of dissatisfaction. Rather, dogs truly derive meaning from their work, approaching each new day with eagerness and anticipation. No matter how simple or complicated the task, working instills a sense of purpose in their lives. What can we learn from them? Congratulations to Kimberly Sernel, Horizon Career Solutions. Kimberly is the latest career professional to earn her Academy Certified Resume Writer (ACRW) credential from the Resume Writing Academy. RWA is an intensive program with very high expectations, so special kudos to all who graduate! Congratulations to Elizabeth Craig, ELC Global, who just renewed her Credentialed Career Manager, an elite designation recognizing contributions to the careers industry through training, public speaking, pro bono work, and other efforts, along with her commitment to her own professional development. Great portfolio of qualifications, Elizabeth! Congratulations to Debra Ann Matthews, Let Me Write It For You, who's been quite busy sharing her expertise. Most recently she conducted a radio interview on "Best Practices in Resume Writing"; was a guest speaker on an international podcast, "The Voice of the Job Seeker"; was quoted in USAA Magazine; and was selected as speaker for the 2015 MD Career Development Association Conference. We're amazed with all you're achieving, Debra! Elevating Your Online Business: Jan 16, 2015. Websites, Blogs & SEO; Content Development & Distribution; Social Media; Lead Generation; Marketing. Enjoy the introductory program for free. Then, decide if you want to take 1, 2, or all 6 of the webinars that Chris Muccio will be teaching. Entrepreneurial Excellence: Jan 22, 2015. 4-Part Webinar Series on Marketing & Business Development; Pricing, Packaging & Profitability; Sales & Customer Relationship Management; Managing Your Business & Boosting Your Confidence. (Meets Jan 22, Jan 29, Feb 5, and Feb 12, 2015.) Attend live webcasts or recording. CTL Associate Quarterly Call with CTL Board: The Now & The New in Coaching: Mar 9, 2015. CTL Associates … Watch for an email from Louise with call-in details. You MUST be an Associate to participate. Click here to learn more about the benefits & opportunities of becoming a CTL Associate ($399 lifetime fee). CTL Conference Event: Apr 16-17, 2015. Details Pending. Resume Writing Academy (RWA) Certification Program: Begins May 21, 2015. The world's most comprehensive resume training program with 6 classes and 9 assignments (all individually graded) on resume strategy, writing, formatting, design, grammar, and more. Hundreds of pages of resources. (Meets May 21, May 28, Jun 4, Jun 11, Jun 18, and Jun 25, 2015.) The Certification Program is also available on-demand. CTL Associate Quarterly Call with CTL Board: The Now & The New in Entrepreneurship & Business Building: Jun 8, 2015. CTL Associates … Watch for an email from Louise with call-in details. You MUST be an Associate to participate. Click here to learn more about the benefits & opportunities of becoming a CTL Associate ($399 lifetime fee). Resume E-Summit: Writing Resumes for People Without a Four-Year Degree: Jun 19, 2015. Learn how to write resumes that showcase the talents, qualifications, and achievements of candidates no matter their level of education. Let each client shine! CTL Associate Quarterly Call with CTL Board: Sept 14, 2015. CTL Associate Quarterly Call with CTL Board: Beyond Resumes & LI Profiles: Sept 14, 2015. CTL Associates … Watch for an email from Louise with call-in details. You MUST be an Associate to participate. Click here to learn more about the benefits & opportunities of becoming a CTL Associate ($399 lifetime fee). Resume Writing Academy (RWA) Certification Program: Sept 18, 2015 Begins. The world's most comprehensive resume training program with 6 classes and 9 assignments (all individually graded) on resume strategy, writing, formatting, design, grammar, and more. Hundreds of pages of resources. (Meets Sept 18, Sept 25, Oct 2, Oct 9, Oct 16, and Oct 23, 2015.) The RWA Certification Program is also available on-demand. Resume E-Summit: Writing Resumes That Give Graduating Students A Competitive Edge: Oct 1, 2015. How can you make one Economics major look more qualified than another? What can you showcase to give that Engineering student a leg up on other candidates? We'll show you how to make graduating student resumes shine! 6th Annual Global Career Brainstorming Day: Nov 13, 2015. Events are held in cities in the US, Canada, Europe, Australia, and other locations (in addition to virtual events). Read previous years' findings. E-Summit: Writing Technology & Engineering Resumes: Dec 11, 2015. These resumes can be some of the most challenging to write. All of the lingo and acronyms can be difficult to understand, it's often tough to get a clear picture of what your client does, and it's easy to be intimidated. We'll show you how to approach these resumes with the "right" writing skills and a confident mindset! CTL Associate Quarterly Call with CTL Board: The Now & The New in Technology: Dec 14, 2015. CTL Associates … Watch for an email from Louise with call-in details. You MUST be an Associate to participate. Click here to learn more about the benefits & opportunities of becoming a CTL Associate ($399 lifetime fee).